The freedom to write about #Ferguson. Late last year, I tweeted out the following photograph. 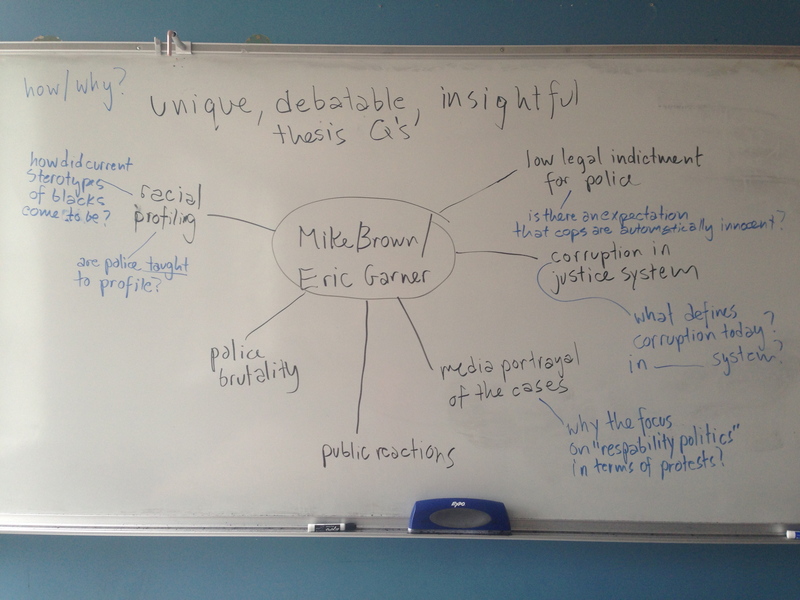 The brainstorm was student-produced a few days after the grand jury decision not to indict Darren Wilson in the Michael Brown shooting. What was great about this brainstorm — apart from the conversation itself — was that it didn’t involve a “break” from our regularly scheduled programming. Juniors already write 2Fer Essays where they analyze a topic of their choice, and we typically pick a topic to play with as a group. Lots of students were keyed up about this topic, and went with one of the questions we generated. But lots of them chose not to as well. Again, I emphasize: I didn’t do anything “special” for this assignment — the vehicle for individual research and composition was already built into our curriculum. That’s a benefit of authentic inquiry. Students know they have a safe venue to ask the hard questions and attempt an answer as best they can. 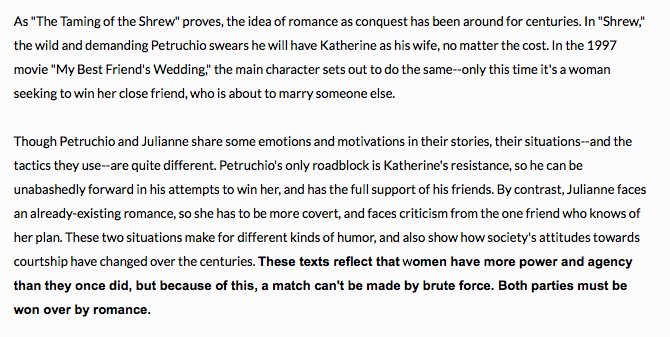 This entry was posted in Curriculum, SLA, Writing on January 21, 2015 by lpahomov. 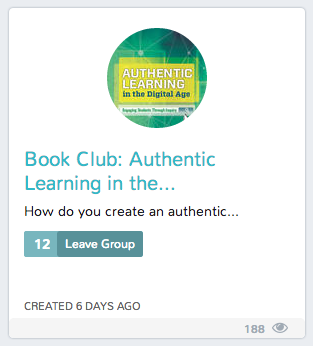 If you’re an ASCD member, you’ve already received your copy of Authentic Learning in the Digital Age. Perhaps you have gotten into the first chapter or two. I am thrilled that you are getting to know the school environment that I enjoy being a part of every day. I am even more thrilled to announce that you have a chance to communicate directly with that environment. Starting tomorrow, myself and ten other SLA educators will be participating in online discussion and sharing of resources via ASCD EDge, their discussion and sharing platform. Have a question about a particular activity? Curious to see the full lesson plan behind an anecdote from the book? Want some advice on how to apply a piece of the framework to your environment? Over the next five weeks, Marcie Hull, Matthew Kay, Tim Best, Pearl Jonas, Stephanie Dunda, and others will all be available to expand on the book and help you get the most out of the text. And the best part is, you don’t have to be a member to sign up for the discussion — just create a profile for ASCD and you’re in! Why are these educators willing to help out? Apart from the fact that they want authentic learning for all students? Apart from the fact that I asked them to, and they are nice to me? Well, you should know that 100% of the profits from the sale of the book go directly to SLA, so we also have a tiny bit of self-interest in seeing copies sell. So if you haven’t ordered yours already, you can do so directly via ASCD or on Amazon. 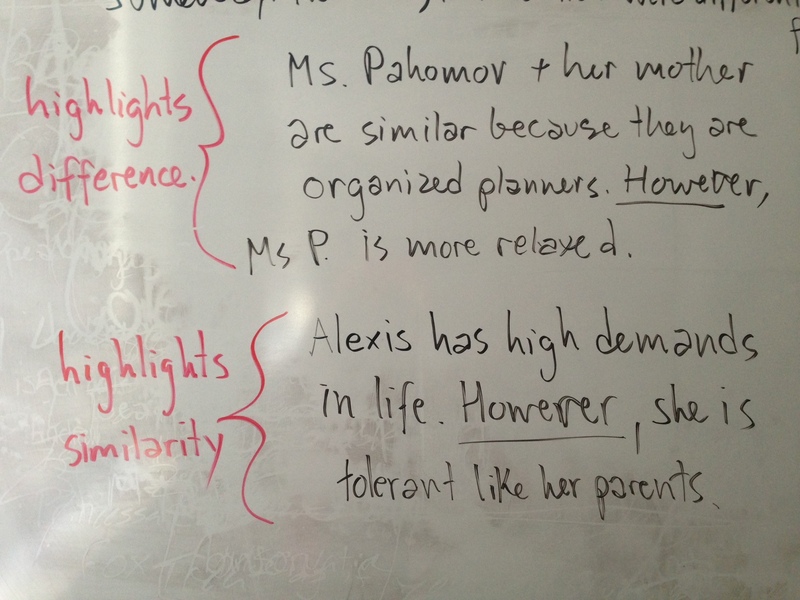 This entry was posted in Authentic Learning in the Digital Age, SLA, Writing on November 9, 2014 by lpahomov. Making Thesis Statements from Commonly Held Beliefs. 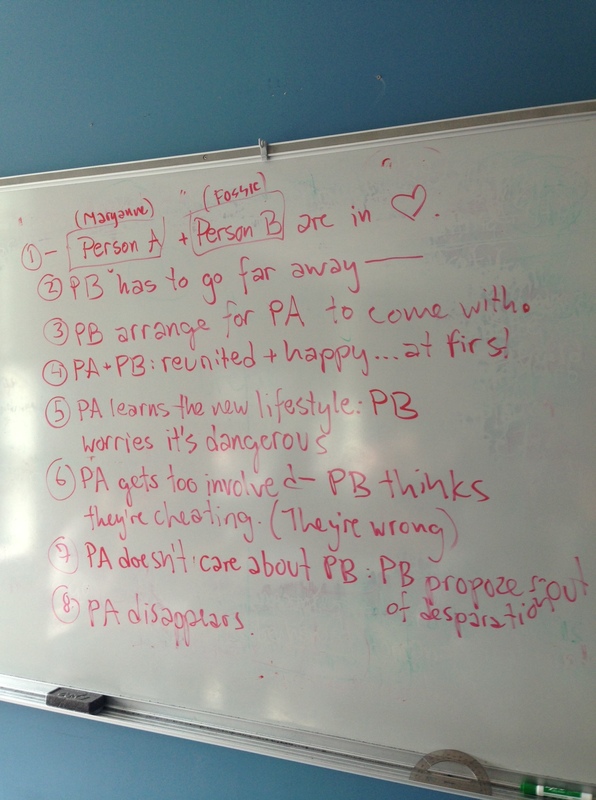 I’ve presented templates for thesis statements on this blog before, and recently in class we did a quick brainstorm activity that was in the same style. When students can’t find a topic to write about, I often encourage them to explore a commonly held belief — not simply to refute it, but to analyze. For the final prompt, the last student had to pick make a choice: either analyze why people continue hold this belief o explain how the belief is faulty. At the end, students had a brief but somewhat coherent intro paragraph: set up the belief, poke a hole in it, and explain why. Successful versions of this read to the class included explanations about the ascendancy of LeBron James (even though some people believe that he’ll never surpass Michael Jordan in his career) and the commonly held belief that Marijuana is a dangerous substance (due to the wealth of popular media that portrays it as such). This entry was posted in Curriculum, Writing and tagged Thesis Statements, They Say / I Say, Writing, Writing Templates on March 10, 2014 by lpahomov. What do you need to know about the SLA model? Today is the first day of EduCon. The school is full of visitors, getting tours from students, poking their heads into classrooms, observing the teaching and learning that goes on, finding inspiration. It seems as good a time as any to announce that, if all goes at as planned, there will be a book published about the SLA model by this time next year! The overall goal of the book is to provide a how-to for both individual teachers and schools/districts to transition to this kind of learning model, especially when they are taking the leap of going 1:1. I feel incredibly humbled by this task. At SLA, we already have a culture of transparency and sharing, but the project has given me a good reason to do some extensive exploration the practice of my colleagues. Technically, I’m the “author” of this book, but I feel more like a compiler of the collective knowledge and practices of the school. What would help you understand and implement the SLA model in your own school? Folks often walk away from EduCon feeling inspired, and this book is intended to give people the advice an guidance needed to kindle that inspiration back in their own buildings. I feel a little bit funny publicizing a manuscript so far in advance — but any thoughts from potential readers would be appreciated. Leave your comments here, or track me down on Twitter or in person at EduCon this weekend. 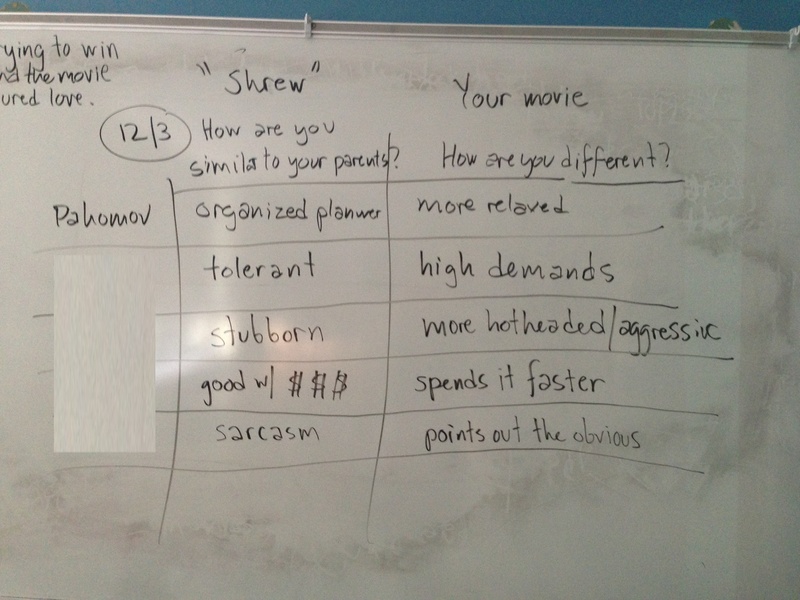 This entry was posted in Big Picture, EduCon, SLA, Writing on January 24, 2014 by lpahomov.